A Cooper’s hawk looks up after landing on a snowy branch during a moderate snowfall in Jan. 2018. Watching birds at my feeders during a snowfall is one of my favorite things to do. This year I’m getting nothing out of the ordinary. Not that I’m complaining because I love seeing the titmice, nuthatches, chickadees, woodpeckers (downy, hairy and red-bellied), blue jays and juncos, but I haven’t seen a single siskin, redpoll, Carolina wren or even goldfinch or white-throated sparrow. A male cardinal makes a very rare appearance. During a recent snowfall I saw nothing for a long stretch. I had been seeing lots of birds earlier in the day and suddenly, nothing. I looked behind the feeding station and noticed why. You guessed it, Cooper’s hawk. Along with sharp-shinned hawks, Copper’s hawks like to check out feeding stations periodically for an easy meal. And why not. The “feeder birds” are there for an easy meal; why begrudge birds of prey one? 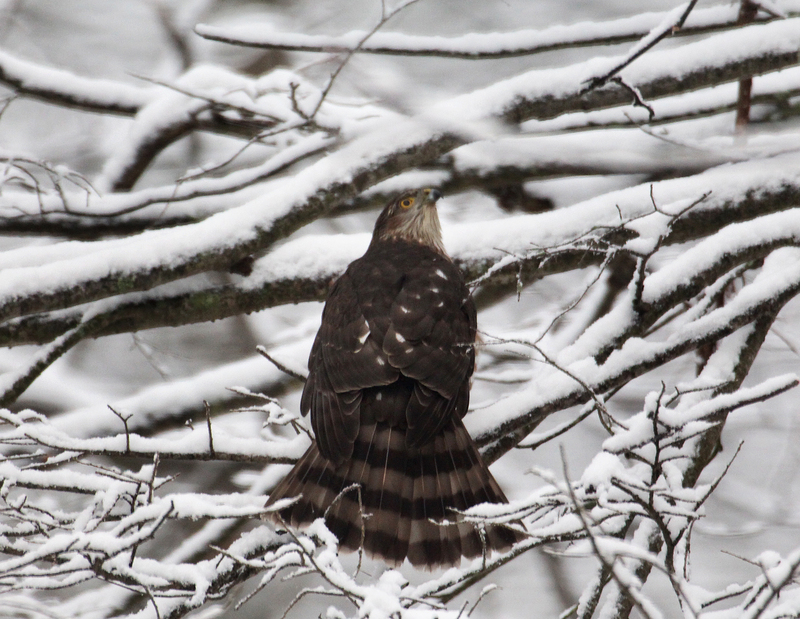 This entry was posted in backyard birding, Birds in snow and tagged cooper's hawk in snow by Chris Bosak. Bookmark the permalink.